Yes, you read it right... a new category! 2015 was an interesting year for my hair. With the red hair color from late 2014 and black hair in late 2015, my hair experienced twice over the difficulty of maintaining healthy, color treated hair. As I've written here, here, and here, dye impacts the hair's porosity, strength, and ability to retain moisture. It can also impact your curl pattern -- something very few bloggers are willing to admit (for whatever reason). As I've said before, color is customized damage. My love affair with Zotos Professional began in early 2015, seeking out this exact product. Whenever I would take a field trip to Sally's, this stuff was never on the shelf. Like, perpetually out of stock. So I did what most product junkies do -- played my tiny violin on their Instagram page. From there, Jodi and the amaaaazing Zotos team sent me major care package love. There are some other pretty dope products in the 180PRO line (like the Rapid Restorer Rinse Out Balm and Total Taming Foaming Smoother), but the Miracle Repair Damage Eliminator is bae. The first reason is because I get to leave it in. All of my other treatments are rinsed out. I have a deep appreciation for a high-powered protein cocktail that I can leave in my hair to prevent breakage. Two, it works phenomenally without interfering with my other products. Miracle Repair Damage Eliminator does not dry out my curls, cause flaking, or any other drama. The third and most awesome reason why I love this product? It protects the ends of my hair like nobody's business. I've received several comments on Instagram complementing the ends of my hair. My ends are healthy, non-scraggly, and curl/wave beautifully. That's all Miracle Repair Damage Eliminator, no lie. It truly does maintain the health and integrity of my curls beyond wash day. Review coming soon! Let me just start by saying this: dry curls ain't cute. Never have been, never will be. My awareness of this reached new levels after I got my hair dyed red in late 2014. My porosity levels were always awkward (anybody remember my never-ending battle with rough ends post chop? ), and the hair color only exacerbated the situation. Instead of just my ends feeling rough, the majority of my strands started feeling janky in 2015. They weren't breaking off (thanks to ApHogee and Miracle Repair Damage Eliminator), but my curls weren't exactly being all they could be. I stumbled into a local beauty supply store, discovered Roux Porosity Control Corrector & Conditioner, and haven't looked back since. My curls are shinier, smoother, retain moisture better, and have an extra spring in their step. The smell is strong, but the Porosity Control Corrector & Conditioner works in literally 30 seconds. You can do anything for 30 seconds. Well, almost anything. Trust me -- this 30 seconds is well worth it. ApHogee Keratin 2 Minute Reconstructor! Why: Because without ApHogee, there would be no 180PRO or Roux to use. 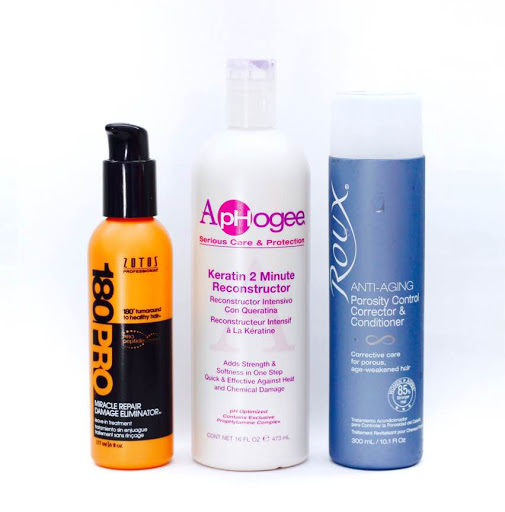 All three products are solidly amazing, but ApHogee Keratin 2 Minute Reconstructor is the foundation. Without it, I probably would be needed to start another transition to natural hair. I can't promise miracles for heat damaged or relaxed hair, but I know for certain that it works on color treated curls. 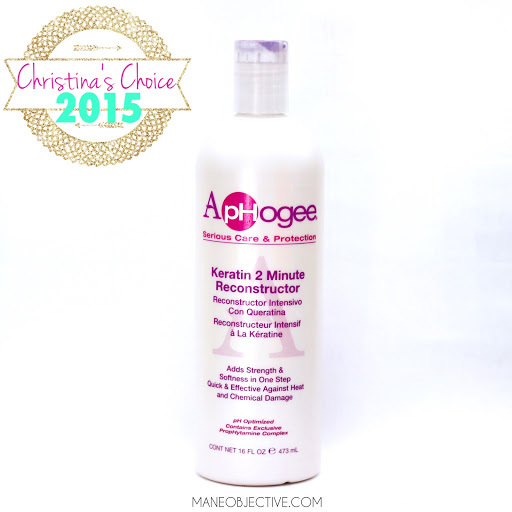 And for those reasons, ApHogee Keratin 2 Minute Reconstructor is the winner! 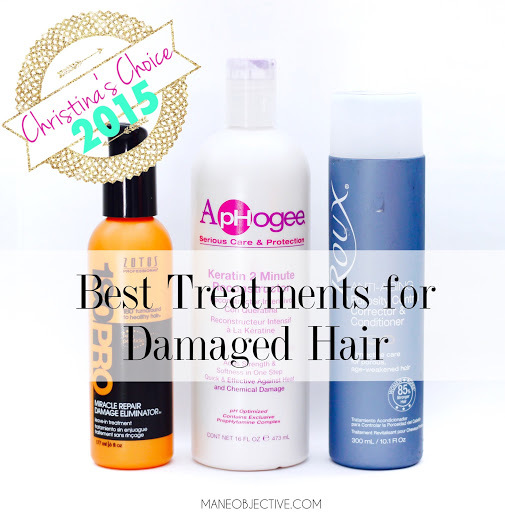 What special damaged hair treatments are winning with you into 2016? Let me know in the comments below! *sigh* Oh Christina, where were you when I dyed my hair nearly 6 years ago? Ah well....at least you're here now, haha! Also, a question you've probably heard a million times over - did they use bleach for your red colour or no? Lol!!! I'm glad I can at least share the good news now! And oddly enough, nobody asked that question. At first I didn't think so, but when I went to Be Kekoa, Brandie was able to immediately tell that they did. Looking back, I would not do that again! Eeek! Did Brandie mention if bleach was the only method to get colour onto dark-coloured hair? I'm amazed it managed to take because of your henna colour! I really like the ApHogee treatment. The mineral oil scares me, so I just don't look at the ingredient list anymore lol. It works that's all that matters, and it's easy on my wallet. LOL!!! You sound JUST like me. I just pretend like I don't see it, and focus on the fact that it works!